Woah-ho! Here comes the Priest with yet another live album! How many does this make it? Officially that’s six, not including live discs within deluxe editions, or live DVDs! Battle Cry is the newest, recorded last year at Wacken (August 1 2015). Some fans like to moan and complain every time an older band like Priest or Maiden release a live album. You can see their point, but at the same time, how much longer will Priest be touring? Don’t you want a live album with all their newest songs? Priest’s last album, 2014’s Redeemer of Souls, was a triumphant return for the band, who had suffered a major lineup change. KK Downing was out, and new kid Richie Faulkner was surprisingly able to take his place on the stage, and in the songwriting. Rather than suffer from this blow, Priest simply kept going full speed ahead. A live album is compulsory after this much activity. Three of the new songs are included on the disc, in among a smattering of classics, but nothing from Nostradamus (2008) or Angel of Retribution (2005). Fear not; you can get some of those songs on the live CD A Touch of Evil. 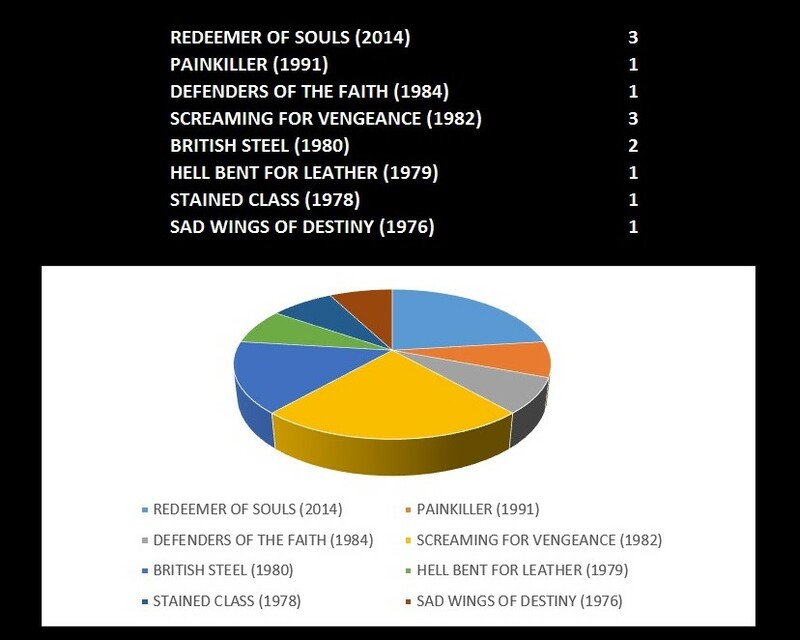 Here is a handy-dandy chart to show you where these songs originated, not counting intros “Battle Cry” and “The Hellion”. You’ll notice a huge 23 year gap in the music presented. This isn’t uncommon for rock bands of Priest’s age. There are so many classics, not to mention new songs to play, but not enough time. As such, albums from later periods, or “cult” songs, are often overlooked. The unfortunate effect of this is an unspoken implication that maybe the music between 1990 and 2014 wasn’t very good. Now granted, Priest did have a lineup change during that period. From 1997-2004, they were with singer Ripper Owens, and Priest have yet to revisit any of that material. Proving that nothing has been lost with the departure of Downing, “Dragonaut” opens the show on a fast heavy note. Faulkner is a perfect fit, acting in unison with Glenn Tipton to produce the same kind of Priest guitarmonies that you’re used to hearing. “Halls of Valhalla”, another new track, rocks just as hard, but with the complexity of the Priest of yesteryear. The musical chops of this band often go overlooked, but just listen to them play. As for Halford? He ain’t no spring chicken, but his singing style has changed to suit. Within that framework, the man is a demon. He can still do things with his voice that few can. The final new song is “Redeemer of Souls”, a little stiff by comparison but certainly up to snuff. A few lesser-played songs really spice up the set. “Devil’s Child” from Screaming For Vengeance is a treat, and “Jawbreaker” from Defenders of the Faith is a nice switch up from “Freewheel Burning”. Wacken probably would have rioted if songs like “Breaking the Law” and “Metal Gods” were not played, so of course you can count on the hits being represented. A long guitar solo and instrumental section during “Another Thing Coming” is another surprise. Halford used to do a long singalong at this point of the show, but that’s been shortened in favour of a pretty damn cool Richie Faulkner guitar solo. Way to give the spotlight to the new kid — that is really classy. Because there’s not enough time on a single disc, “Living After Midnight”, the final encore of the show, was axed. Instead, “Painkiller” ends this CD, certainly an interesting choice for a closer. This is the only song during which Rob’s voice can’t keep up. The song is just insane; it always has been, and you can’t fault the guy for not quite getting there. Battle Cry is yet another in a long string of great live Judas Priest albums. Shoulda woulda coulda been a double CD. The only two songs missing from this show are “Turbo Lover” and “Living After Midnight”, but wouldn’t you prefer having them? Yesterday we examined Judas Priest’s British Steel, the original album and first CD of this three disc set. Today we’ll look at the live stuff and packaging. If you missed yesterday’s installment, click here. iTunes download with all the music from both CDs plus the missing song (“Prophecy”). The 2 CD/DVD edition is beautifully housed in digipack, with lots of photos in a nice booklet with essay. The photos are all from their recent tour; none are vintage, which disappointed me. I would have loved some fly-on-the-wall photos of them recording this album at Ringo Starr’s house, Tittenhurst Park. Maybe no such photos exist? The second CD, only available in this edition, is packed to the brim. “Prophecy” wouldn’t have fit or the CD would have run over 80 minutes. Otherwise, it is a straight stereo mix of the same content on the DVD. With audio being my primary medium to enjoy, I obviously needed the version that came with the live CD. The iTunes bonus track was available for separate purchase, so that was easy to add to my files, once ripped. The third disc of course is the DVD. Backed by a British Steel backdrop, Priest played the album in sequence remarkably well considering their ages! Only drummer Scott Travis wasn’t around for the original album, but he plays the drum parts pretty straight to the original, minus Dave Holland’s robotic coldness. The main question people have when discussing Priest live is, “What was Halford’s voice like?” It is true that he is an older man today and has to restrain himself and change arrangements in order to sing the songs. This is no exception, but man, when he screams, he still has it! He just screams less, which makes sense. The vocal melodies of some songs have been re-arranged, which may or may not be to your taste. Surely, the vocal melody is such an important part of each song. Halford sings what sounds like harmony parts to the original melodies in order to sneak around certain high parts. It is what it is. And, as per many concerts, the audience sings some choruses on their own when it comes to the big hits. I was pretty impressed with the live stuff after British Steel. This is surely one of the best live versions of “Victim of Changes”. Halford nails that angry end scream perfectly, I thought his head would explode. “Hell Patrol” was a nice touch. “Freewheel Burning” stumbles a bit. “Prophecy” was excellent, and I’m glad a Nostradamus track was included. Halford seems to relish spitting out the words. Satisfyingly, “Diamonds and Rust” is done in its electric version. An excellent surprise. The album ends, predictably, with Halford’s “audience participation” thing, and “Another Thing Coming” which I could probably do without at this point. One thing I’m starting to notice, is that Priest are sort of nerdy live. From Rob’s audience participation thing (“Yeah, yeah yeah yeah yeah yeah YEAH yeah!”), to the stage moves, to Scott Travis’ weird drum stick thing on “United”, this is the concert equivalent of a Star Trek convention in some ways. But Priest have never been trendy, and they’ve always seemed oblivious to it. I guess that’s what makes them cool. The DVD is rounded out by 30 minutes of interviews with Rob, KK, Glenn and Ian (no Scott). This is the kind of thing most people would probably only watch once, especially when the Classic Albums series already released a full DVD of the making of British Steel. Now to the British Steel 30th Anniversary set as whole: As good a package as this is, I wish there was less emphasis on the “today” portion and more attention paid to the 30th anniversary of the original album. There is at least one unofficial full concert CD from the 1980 tour out there (live in Denver), released unofficially. Surely Priest could have included some vintage live recordings as well?. 4/5 stars. Despite my beefs, this is a great collection for your collection! It’s the end of PRIEST WEEK! It was all Judas Priest all week, and what better way to end it then with a 12 CD remastered box set? In late 2001, local record store legend Al “the King” dropped into my store to sell some discs. Nimble-minded readers will recall that on day 1 of Priest Week, Al King sold me my vinyl copy of Rocka Rolla in 1989! Al now worked at another store in town called Encore Records. Al’s a good guy. He didn’t see us so much as competition, because really we catered to different groups of people. There were certain discs that Al couldn’t sell at Encore (pop and mainstream stuff), and he knew I would give him the fairest prices in town, so he came to me. It was a good mutually beneficial arrangement. I wanted his stock and he wanted the money! On this afternoon, I chatted with Al while going through his discs, and he informed me of a forthcoming Priest collectible. “Tell me more!” I said to Al. The details were scant. The box set was titled The Re-Masters, and it contained four CDs with room for the other eight, sold separately. The CDs included with the box were the first four of the Columbia years: Sin After Sin, Stained Class, Killing Machine (Hell Bent for Leather) and Unleashed in the East. It was an attractive box, printed to look like it is held together by metal rivets. There was also supposed to be a booklet included. At the time, I was obsessed with collecting the “best” versions of anything. This meant having all the songs, and the best packaging available. I asked Al to hold the box for me. At various points in the conversation, I felt like Al was trying to talk me out of buying it due to the price! What Al didn’t understand was my deep obsession for this band. A few days later I headed down to Encore and bought my treasure. I eagerly opened it up and discovered one little additional bonus! Nothing major, but cool enough for me: the four CDs included had embossed silver logos on both front and back covers, instead of the regular printed ones. This differentiated the discs from the versions I could buy separately at retail. Also, Hell Bent for Leather was indeed included under the UK name Killing Machine, something I hadn’t seen on CD before. Finally, once all 12 discs were collected, together the CD spines read JUDAS PRIEST and depicted their “devil’s tuning fork” logo. The spaces for the 8 discs sold separately were taken up by individual foam spacers. Back covers with silver embossed “tuning fork” logo, and without. The bonus tracks were a mixed bag of live and demo songs from all over Priest history, but some, such as “Race With the Devil” (The Gun cover) were incredible and classic. One by one, I added to the set. Some discs came in used rather quickly: Point of Entry was one such disc. Others I had to order via Amazon, or buy in-store at Encore, such as Turbo and Painkiller. But I did get them all, and my complete Priest Re-Masters set has served me well for over a decade now. Although I have since bought the newer deluxe editions of Screaming for Vengeance and British Steel (with bonus DVDs) I have felt no need to replace this box set with anything else. Having to buy the discs individually and complete it myself makes it rare to find, not to mention the box was made only in small numbers. Some fans expected more out of the box set, and some were upset that the Gull Records and Ripper Owens years are not represented inside, even though Ripper was still the current singer. My attitude was and is, “Who cares?” It’s a great looking set and it comprises a complete era of Priest. I like it a lot and according to Al King I’m one of two guys in town that own it. Cool. 1973 to 1993? But didn’t the first album (Rocka Rolla, which has no songs on this CD) come out in 1974? Doesn’t this CD only actually include music from 1977-1990? And didn’t Al Atkins form the original Judas Priest in 1969? 1973 was the year that Atkins left to be replaced by Rob Halford, who himself quit in 1992. So, 1973-1993? OK, I guess I’ll play along. Due to complications and conflicts with Gull Records, Metal Works 1973-1993 contains no songs from the first two albums (the aforementioned Rocka Rolla and Sad Wings of Destiny). Instead, a live version (from Unleashed in the East) of “Victim of Changes” is subbed in to represent the early period of the Priest. After that, every album is given a look-see. Aside from the tracks that couldn’t be included for legal reasons, it is hard to argue with most of this track list. It is a near-perfect representation of pre-Ripper Priest, with the odd track I’d swap out for another, but more or less awesome all the way through. Personally I think “Night Crawler” is and pretty much always has been an excessively cheesy song…like sharp cheddar. I would have put on something else from Painkiller, like “Between The Hammer and the Anvil” or the battering “Hell Patrol”. Most conspicuous by its absence is “Green Manalishi”. Maybe the band decided not to include a cover (Fleetwood Mac), even if it’s one of the best things that Priest have ever recorded. I think “Green Manalishi” today is equally associated with Priest than Fleetwood Mac, if not more so by a hair. It may as well be their own song. Many longtime personal faves are included: I love “Bloodstone”, “Desert Plains”, “Night Comes Down”, and “Blood Red Skies”. These are songs that weren’t necessarily “hits”, but were huge hits with my teenage self. There’s one inclusion that bugs me, and that’s “Headed Out to the Highway”. I love that song, but unfortunately somebody chose to use the Priest…Live! version over the original Point of Entry track. Furthermore, none of the live substitutions are listed as such on the back cover. There is no indication on the back that any songs are anything but the original. I consider that dishonest. The liner notes are interesting for a quick read; tales from four of Judas Priest’s members (Rob, Ian, KK and Glenn) for each of the songs. Nothing earth shattering, just some fun brief stories. It’s interesting, however, how Priest completely glossed over Rob’s departure in the liner notes. Indeed, by reading, one would have no idea he was gone. A little misleading to the metal mongers of the time, especially with Rob about to debut his new band Fight a couple months later…. This 2 CD set is polished off with some fine artwork from Mark Wilkinson, tying in the “metal works” theme with a nod to Birmingham with some iconic characters and images from Priest covers past. The Painkiller does battle with the bird of prey from Screaming For Vengeance, with lots going on in the background. The summer of ’93 was loaded with expensive sets for metal fans to buy. Ozzy Osbourne put out the double Live & Loud. Van Halen released Live: Right Here, Right Now, also a 2 CD set. Iron Maiden had two separate single disc live albums, followed by a double live in the fall. That right there is a lot of cash to be spent, and that’s just a handful of essential purchases that fans had to choose from. There was a ton of new music to buy, not including the grunge bands vying for our dollars that year. Priest failed to deliver in terms of value. Metal Works 73-93 was an expensive collection featuring no music fans didn’t have, and those darned live tracks. It felt tossed off. Its PRIEST WEEK! Yesterday’s installment: Rocka Rolla (1974). I have a long history with Priest…Live! My cassette was originally bought at Stedman’s in Kincardine Ontario, July 1987. An LP copy was sold to me by a co-worker named Chris from his own collection about a decade later. Finally I bought a 2 CD remaster which is the last version I hope I’ll need. Because of this album’s crucial role of introducing me to “old Priest”, I have a really hard time being critical about it. I will say this: This version of “Metal Gods” with the really melodic chorus is awesome. It’s my favourite version of this song, by a fair bit. I don’t know if that was live or overdubs or backing tapes or whatever. It sounds really cool. Regardless of how I feel about “Metal Gods”, I can tell you that Priest Live covers pretty most all of the critical post-Unleashed numbers from 1980 (British Steel) to 1986 (Turbo). You get all the tracks you’d expect from the 1980’s: “Freewheel Burning”, “Turbo Lover”, “You’ve Got Another Thing Comin'”, “Living After Midnight”, “Heading Out To The Highway”. Clearly the concept here is to have no songs that overlap with the band’s previous live album, Unleashed in the East, a tactic used by other bands such as Kiss, on records like Kiss Alive II. While being fair to the fans economically speaking, as a live concert experience that means you’re missing out on “Green Manalishi”. Luckily this remaster is now expanded to two CDs, and decked out with three bonus tracks including the crucial “Hell Bent For Leather”, but this remains the only holdover from the pre-1980 period. While the home video/DVD version of Priest Live contains “Green Manalishi”, that video was taken from just one show (Dallas, Texas) while the CD has songs from an Atlanta concert as well. Essentially the CD and DVD versions are two different things. In addition to “Green Manalishi”, the DVD also has “Locked In” and “Desert Plains”. Live versions of these songs do exist on Priest remasters, but they are different versions, not the Dallas recordings. Live in Dallas, but not the version on the album. I know from an old Guitar World interview that KK and Glenn felt the album could have been mixed better, that too much time was spent “fixing it” in the mix. Sure enough the crowd noise sounds artificially enhanced and there are backing vocals that I am certain are not live. Otherwise, the record sounds pretty good! But that could just be the nostalgia talking. The guitars could have had more teeth; it was the 80’s though. Dave Holland’s snare sound is in the annoyingly high range, but these are not major concerns. Halford’s interaction with the crowd is more friendly than usual, which is nice especially after viewing something like the Rising in the East DVD. He does do a couple annoying sing-alongs, with the crowd…I’m sure it was fun to be there, they’re not fun to listen to on headphones. One more nostalgic point: I remember buying this back in that summer of the 1987 and thinking, “Why did Priest change their logo?” I loved the old logo. I never really thought this was a good album cover. Very plain, which seemed to be the fashion in the late 80’s, a decade that Priest Live embraces without shame.